Musk Predicts First Mars Short Space Trip In 2019; Sees Martian Colonies With "Pizza Joints And Night Clubs"
Seemingly unbothered by such trivial and mundane developments such as the recent price action of Tesla, which unlike many of its money-burning "story" peers has seen its stock languish this year amid growing sellside skepticism and downgrades, Elon Musk told an audience at South by Southwest to think big, and that his timeline for sending a space vehicle to Mars could mark its first short space flight as early as the first half of 2019. Recall that Musk's SpaceX announced in September 2017, that it aims to send a cargo mission to the Red Planet by 2022. 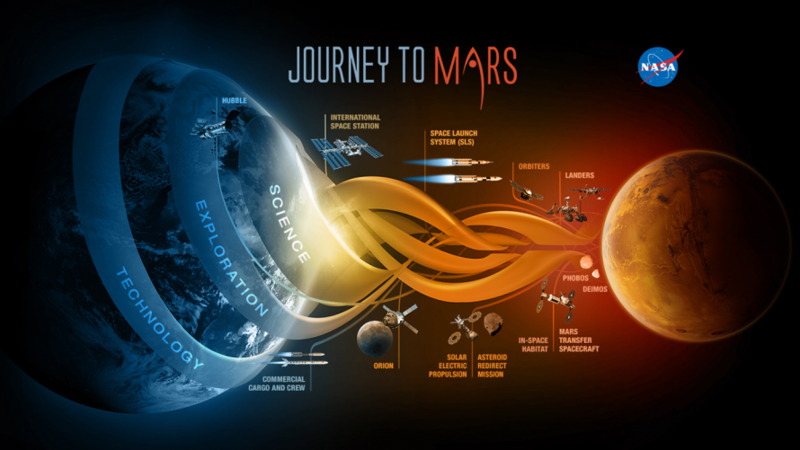 SpaceX's ultimate objective is to plant the seeds to put a human colony on Mars. A colony, mind you, that will cost a lot of taxpayer subsidized cash. Sporting Tony Stark facial hair, Musk outlined SpaceX's plan today at the 67th annual International Astronautical Congress in Guadalajara, Mexico. It involves a slew of new technology: gigantic, reusable rockets; carbon fiber fuel tanks; ultra-powered engines. Plus spaceships capable of carrying a hundred or more passengers to the Red Planet, landing, then returning to Earth to pick up more. Musk doesn't just want to go to Mars: He wants to build a civilization there. Which means he'll need all that sweet gear to make it cheap enough to work. Cheap, of course, is relative. Still, Musk estimates that buying a single ticket to Mars right now (using non-existent tech) would probably cost around $10 billion. The same amount of cash could buy you a few square blocks in Midtown Manhattan. But once the so-called SpaceX Interplanetary Transport System is fully operational, he estimates that a person will be able to travel to the Red Planet for around $200,000. Take a ride with Elon through his Martian fantasy. You and 99 or more other passengers board a huge crew vessel atop a massive new rocket—combined, they are about as tall as a 40-story building. Forty-two Raptor engines rumble to life below, and soon you and your fellow pilgrims are gunning through the upper atmosphere at tens of thousands of miles per hour. After depositing you in orbit, the first stage booster drops back to Earth, and flies itself back to the launchpad at Cape Canaveral. After some indeterminate refurbing, a crane attaches another spaceship on top. Except this one has no people. It's full of fuel. The rocket launches again, and releases the spaceship, which meets your spaceship in orbit and transfers its fuel load into your ship's tanks. Repeat a few times until your ship is topped off. Then, you head for Mars. All of the above summarized in just three symbols: $$$. Of course, Musk would never admit that, instead he has much loftier ambitions - no less than saving humanity from near certain doom. As Musk put it at the beginning of his speech: "I really think there are two fundamental paths [for humans]: One path is we stay on Earth forever, and some eventual extinction event wipes us out." "I don’t have a doomsday prophesy." "But history suggests some doomsday event will happen." "The alternative is, become a spacefaring and multi-planetary species." But back to Musk's grand visions of humanity's next bold step to Mars: the SpaceX CEO held a surprise Q&A session at the annual technology and culture festival South by Southwest in Austin, Texas on Sunday, where according to CNBC he told attendees that "we are building the first Mars, or interplanetary ship, and I think well be able to short trips, flights by first half of next year." Of course, when it comes to Musk and his calendar milestones, one should add a decade just to be safe. And indeed, mindful of elevating expectations too high, Musk hedged: "Although sometimes, my timelines are a little, you know..." he said to laughter. So what does Musk need, if not more money (yet)? "The biggest thing that would be helpful is just general support and encouragement and goodwill," Musk said. "I think once we build it we'll have a point of proof something that other companies and countries can go and do. They certainly don't think it's possible, but if we do they'll up their game." Actually, scratch that: lots of money will be needed after all: Musk said that in the intermediate term, Mars will need Glass domes, a power station, and an assortment of basic living fundamentals. To start, Mars will have "the most elementary infrastructure. Just a base to create propellant, a power station, blast domes in which to grow crops, all the sort of fundamentals without which you could not survive." Musk said the first human colony on Mars won't be an "escape hatch for rich people," but will instead be a place where a small group of people "for whom the excitement of the frontier exceeds the risk and danger" plants the seeds for a democratic, entrepreneurial society. Translation: only rich people need apply. After the infrastructure is complete the colony fun will begin with "an explosion of entrepreneurial opportunity because Mars will need everything from iron foundries to pizza joints to nightclubs" he said, probably to even more zombified laughter. Musk raised eyebrows when asked about the source of his inspiration: his answer: Fred Astaire and Kanye West. As to whether Musk sees himself as the ruthless dictator in charge of an entire planet, Musk said Mars will probably be a direct democracy, with votes on every major issue.